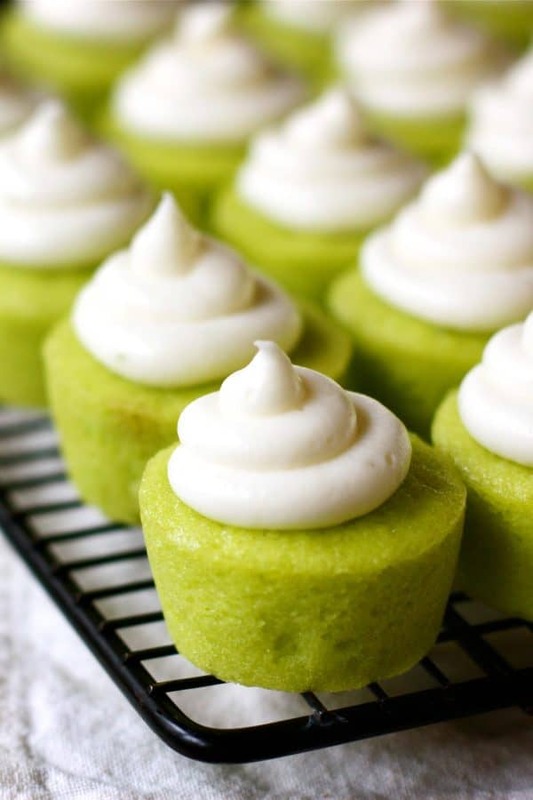 These vibrant Lime Baby Cakes are fun, ultra tasty, and completely addictive! Buttermilk makes these mini cupcakes dense and moist, and lime juice and zest give them zingy fresh citrus flavor. 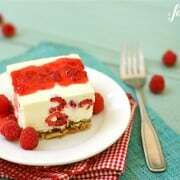 A swirl of cream cheese frosting on top offers the perfect creamy contrast. 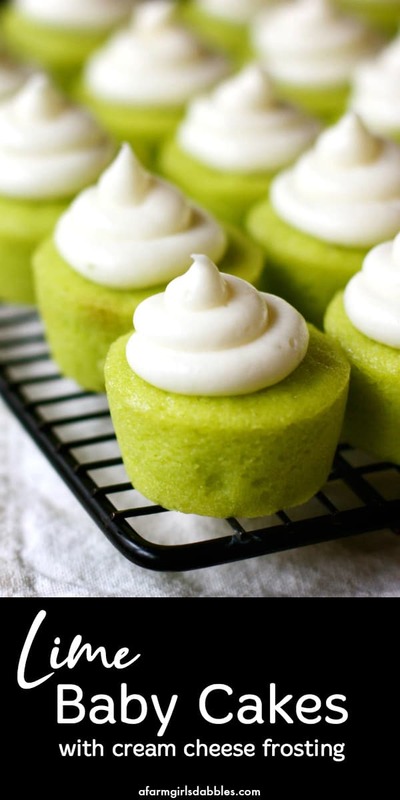 These Lime Baby Cakes are for Mom. 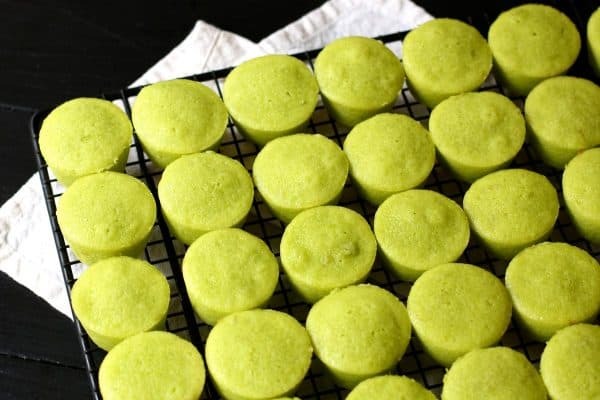 So whenever I make these Lime Baby Cakes, I stash a few away in the freezer for the next time she visits us. It’s what any good daughter would do, right? I hope you like these awesome little cakes – they’re also especially great for St. Patrick’s Day and Cinco de Mayo. But really, these baby cakes would be welcome at most any celebratory occasion! These lime cupcakes have my mom’s name written all over them. Not only are they green, one of her favorite colors, but they’re also bright with citrus flavor. Because I wanted all that vibrant green color to show through in the most maximum way possible, I knew I wanted to forgo paper liners. So I found these awesome silicone cupcake pans for this recipe. The individual cups in the pan hold just a bit more than my other mini cupcake pans – and I love this bit larger size! Ohhhhhh, to go back in time. I smile at this photo. 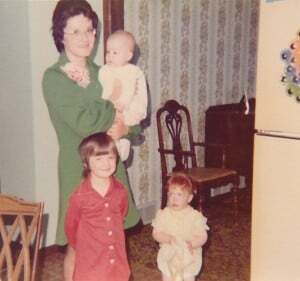 This picture was taken on Mother’s Day when I was five years old (I’m in the red dress). 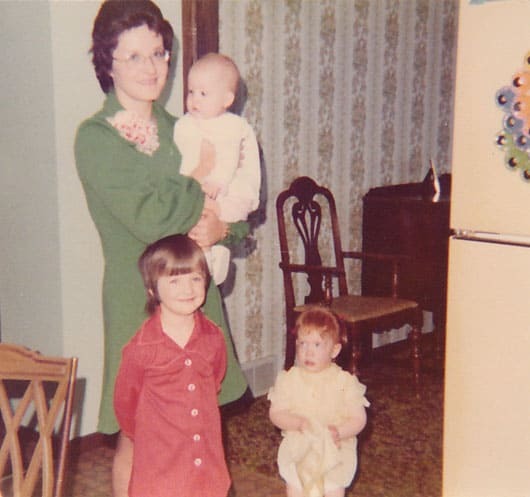 Notice the flowers on Mom’s lapel. Dad always gave Mom a corsage of fresh flowers to wear to church on Mother’s Day morning. I always liked that my dad did this, and anticipated seeing what he would bring home for her to wear each year. 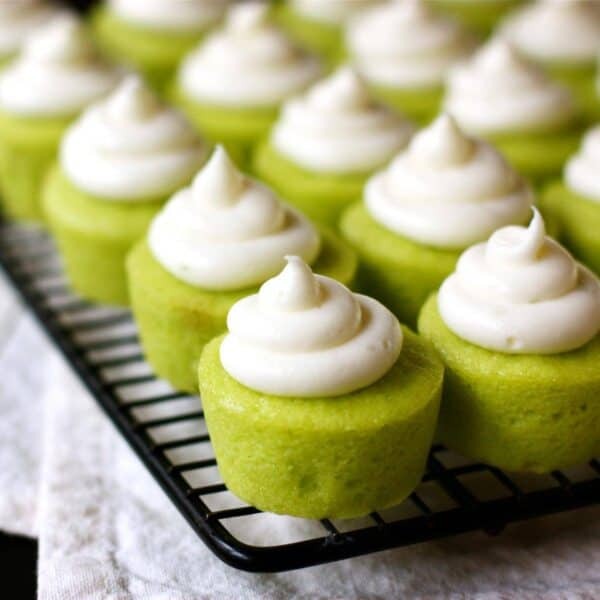 These vibrant green cupcakes are fun, ultra tasty, and completely addictive. The buttermilk in the batter makes the cupcakes dense and moist. And with real lime juice and zest, they are zingy with fresh citrus flavor. And I don’t think I need to sing the praises of cream cheese frosting too loudly, as it seems most people are already fans. But the creamy frosting is the perfect contrasting topper to the brightness of the cake. They work marvelously together. I first made these for a friend’s party where a selection of smaller 2-bite desserts was served. The original recipe is for regular size cupcakes, however, I adapted it to make “baby” cakes for this occasion. The little cupcakes went over so well that first time, I’ve never made them any other way. This recipe has been a popular one on the blog, but especially so around St. Patrick’s Day, Cinco de Mayo, and springtime in general. Of course, I always think of them at Mother’s Day. 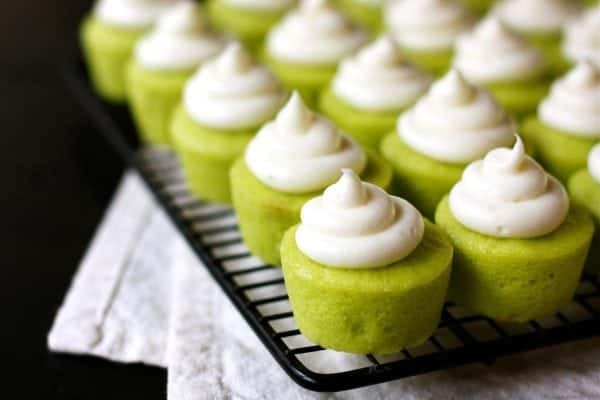 Like this lime cupcakes recipe? Pin it! For the baby cakes: Preheat oven to 350° F. A couple notes: I prefer to use flexible silicone mini muffin pans with no paper liners for this recipe, but you can also prepare metal mini muffin pans with paper liners. 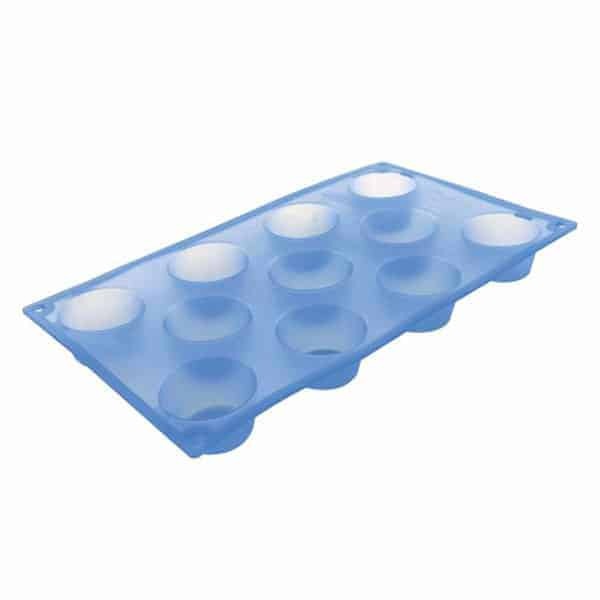 I use these silicone muffin pans, which yield a little bigger mini cupcake than most - which I like! Sizes of mini muffin pans vary quite a bit, so your yield and baking time may vary. I set the silicone muffin pans on sheet pans, for sturdiness. In a large bowl, beat butter until smooth. Add sugar and beat to blend. Beat in eggs one at a time, then the lime juice, lime peel, and food coloring. Batter may look curdled, but that's just fine. Beat in the flour mixture alternately with the buttermilk, in 3 additions. Spoon batter into liners, about 2/3 full. Bake cupcakes until tester inserted into center comes out clean. This takes about 20 minutes for me, but it will depend on the size of your tins, so pay close attention to your baking time. Cool 10 minutes and remove from pan. Cool completely before adding frosting. For the frosting: In a medium bowl, beat all ingredients until smooth. 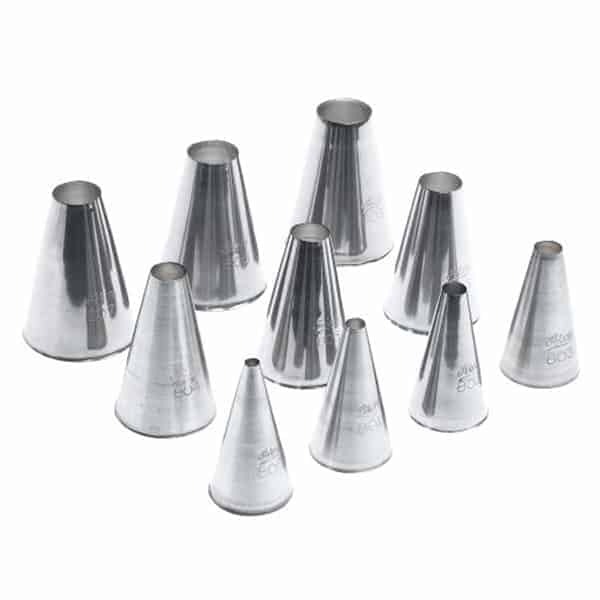 With a medium-large plain round pastry tip (I like to use one that has a tip opening of about 5/16"), pipe frosting onto cooled cupcakes, or simply spread it on with a knife. 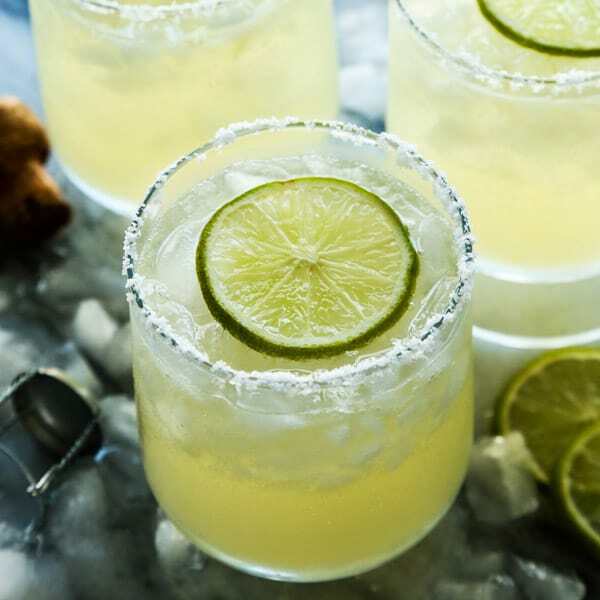 Sprinkle a bit of fresh lime zest over tops, if desired. 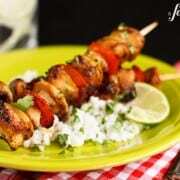 This post was previously published May 2010 and has been a popular recipe with family, friends, and readers. Some of the photographs and text were updated in 2018. 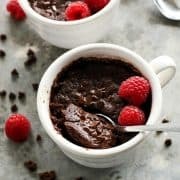 Thank you so much for this recipe! These are my favorite cupcakes I’ve ever had. I made them without the food coloring, but added lime zest on top of the frosting to incorporate some green. They were so delicious; everyone loved them! I feel like I will love these cakes! Many thanks for the write-up! 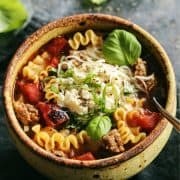 Your recipe is pretty much helpful! Awe that is such a great picture and I love that your first commenter is from mom! Such a sweet post and these cakes look perfect! 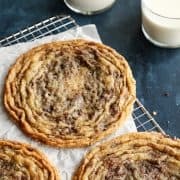 I crossed this recipe looking for some tasty treat to sell at my work, and BOY, are these the ones! I love it! Instead of the frosting, I used a simple lime glaze.. Soooo good! do you use cupcake trays for this? Hi Tammy – if you look in the recipe directions, I explain the kind of pan I used. Thanks! what a lovely tribute to your mom ~ these cupcakes are soooo cute and they look so tasty! I can’t wait to try this recipe out! I am definitely going to try out this recipe for the lime baby cake! I love the color of them! They look fresh and vibrant. Could I ask are they soft and spongy too? These were very good and got an overall rating of 3.5 out of 5 stars! The only thing I noticed is that the cake turned slight brown around the edges. Why does that happen? or is it only me? These are great! I love the color, it’s perfect for my sister’s baby shower, and she loves cream cheese frosting as well. The only problem is I don’t think she’s a big fan of lime flavored desserts. If I left out the lime and added vanilla do you think they would taste good? Sorry to be manipulating what sounds like an amazing recipe! Hello Jaime – I do think these cupcakes would taste good with vanilla and no lime. The green color, however, doesn’t fit the flavor, but if you’re just trying to color coordinate for the shower, I think that’s reason enough to try it. If you do this, please let me know how it goes! Oh, Brenda, these are delicious. I made them tonight to test them out for an order for this weekend because the customer had requested something “key-limeish”. These are perfect! Ooooh !!! 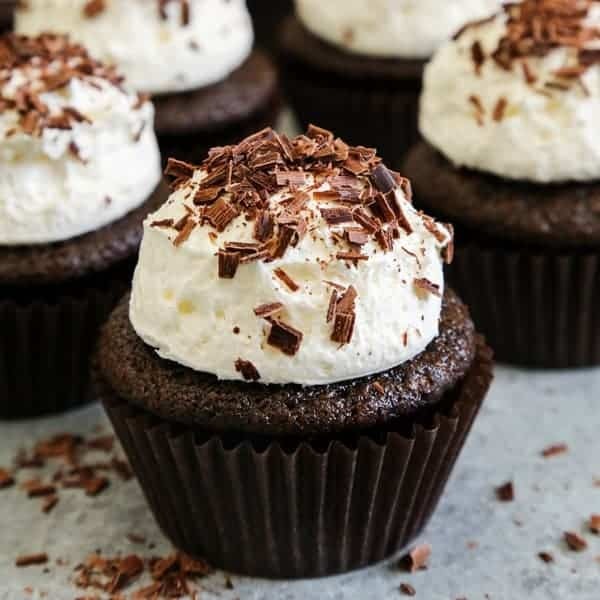 These mini cupcakes looks so cute and super delish , love the recipe and the post :) . I’ve been testing recipes for my sister’s wedding next June and made these for the first time today. They’re delicious! For her semi-formal reception, I think the lime green popping out from beneath the white frosting will be super cute. Thanks for the recipe! 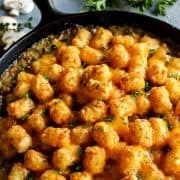 The recipe looks awesome and I’m going to try it tonight! 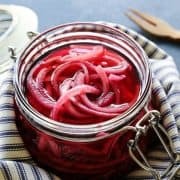 Question though, do you think it would work with lemon the same way, maybe just dial back the amount of lemon juice/zest used? 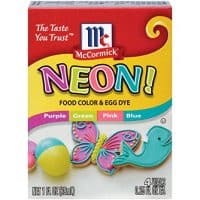 My mom is a HUGE fan of any dessert that’s lemon and I was thinking of trying that (and coloring them yellow) for Mother’s Day…she would love how cute these are too. What do you think? I am going to try that also, Sara. Why wouldn’t it work for lemon lovers? These are adorable! Love the unique color. Not one you see often in baked goods. Thanks, Katie – so nice to hear from you! They are really fun. People are always curious to try them, and usually end up really liking them. They are a favorite around here! Hi! 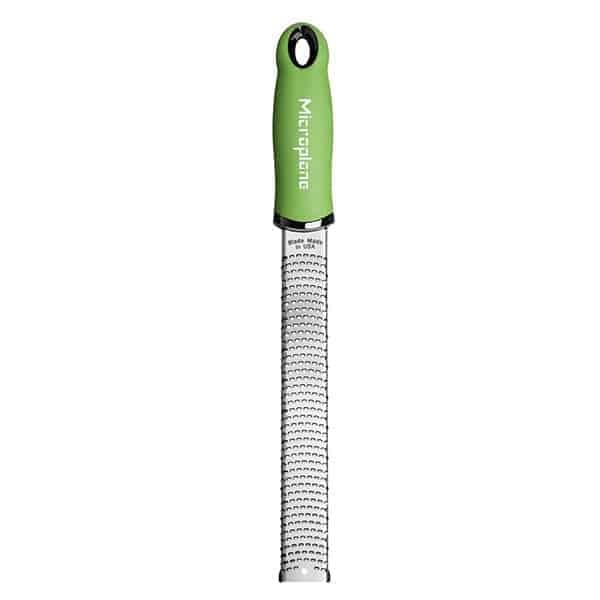 I’m in love with all things Key Lime! Question: The recipe calls for lime juice. Is that a real lime, or key lime juice? I live in South Florida, so it’s really easy to get. Thanks for the fun idea! These are reallly cute!!! :D I love the color. These are adorable and perfect for spring! back a lot of good memories.